While I was traveling around the world, one of the things that never ceased to amaze me was just how many events seemed to converge at specific times and places so as to uniquely enrich my travel experiences. Sometimes the “coincidences” were so extraordinary that I felt as if the whole universe were preoccupied with my journey; planning everything so that my travels would become even more special than they already were. Having studied the writings of Carl Jung, who was the first to seriously investigate meaningful coincidences (and who coined the term “synchronicity” to describe them), I started to become more aware of their frequency. I gradually realized that the synchronicities multiplied the more I observed them. The feeling that the whole event was happening just for me, the protagonist in the story – as Horace says. That I was destined to be where I was at that exact place and time, with Fate pulling the strings of my life. I felt that the universe, both animate and inanimate, has a purpose and a meaning that is part of its makeup. This grand meaning may lie beyond our understanding or even beyond rational thought itself. Yet it is there, for only through a pervading meaning in the structure of the cosmos can these incredible meaningful coincidences be explained. The weirdness of the experience was prevalent, and it made me become even more mindful of what was going on. “Weird” also meant “special”– again, just for me. I arrived on the third of October 2006. The next day, there was a special event going on at the Ahu Tahai site: The moai were illuminated at night for the first time in history! And only this particular group, not the other moai in other locations on the island. In front of the moai, a dance troupe from the Cook Islands, flown in for the occasion, performed Polynesian dances, not only for the few lucky visitors who happened to be there, but also for the honored moai themselves. It had been centuries since the moai had last seen and heard the dances and songs of the Polynesians who had created them. The invading Spaniards, in one of their many horrible colonialist crimes, had abducted the last surviving Easter Islanders, including the chief and the educated class, and sold them as slaves during the mid-eighteenth century slave trade. With the last islanders perishing, the only remaining key to deciphering the only written script of the Polynesian world – the unique Rongorongo glyphs invented on Easter Island – had also vanished forever. The world of the moai would henceforth remain forever mute, sad, immersed in a depressing darkness. Yet, on that special night, I felt as if that dark veil had been lifted, if only for a couple of hours. And that this once magical, extraordinary civilization had come alive once again. 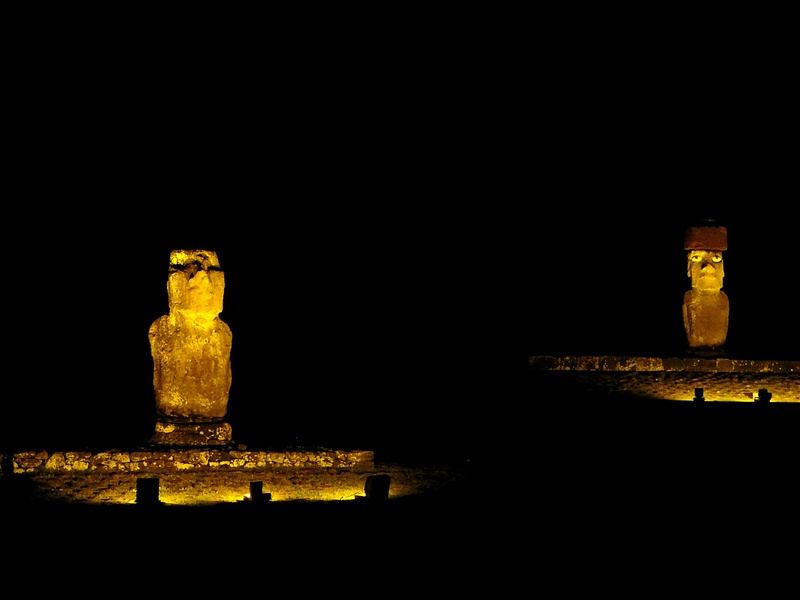 The moai’s bodies and their mysterious reconstructed eyes shone in the enveloping darkness. It felt as if they were witnessing and understanding everything. There was a weird light and energy and joy that must not have been seen nor experienced for centuries on this remote island. Since there was no announcement for the event, the only way for me to have attended it was to have actually lodged in the place from which I could see the preparations for the event earlier in the day and, of course, to have been on the island on that specific date thanks to my delay in Santiago. The moai had been waiting for 800 years to shine in the night. The reason is obvious: They wanted to do it when I was there. PS: It turns out that Philips, the Dutch electronics company, had organized everything, as part of a worldwide marketing campaign.